The warm winter and early spring have created ideal conditions for bedbugs to multiply on an epidemic proportion, experts say. The top cities where bedbug infestations occurred in 2011 were Cincinnati, Chicago, Denver, Detroit and Los Angeles. A new list from national exterminator Orkin highlights the status of bedbug infestations in the top 50 cities, but shows an overall increase in bedbugs nationwide. According to Justin Douglas of Planet Amazing, "the only good news is in New York City where the recent relentless bedbug epidemic has tapered off and is seeing some relief. But with the mild winter and early spring, temperatures have been warm enough for bedbugs to grow to epidemic proportions in other places," he says. There are several ways that a home can be protected, he says. When coming home from any vacation, it is best to put all luggage in the dryer for at least 15 minutes, and wash and dry all clothes immediately. This is because bedbugs will die at a temperature of 122 degrees Fahrenheit. "Bedbugs look like an apple seed in size and color, so it is possible to look for them. They multiply quickly and can become a problem fast," Mr. Douglas says. "If bedbugs have infested a bed or a home, the best method we recommend is to get our three-part system Bed Bug Shredder, which has a carpet powder, a laundry additive, and a spray. These three approaches together can kill bed bugs quickly and for much lower cost than other methods such as exterminators." The top cities where bedbug infestations occurred in 2011 - according to the Orkin report - were Cincinnati, Chicago, Denver, Detroit and Los Angeles. "College dorms, hospitals, alcohol and drug treatment centers, and many more living areas are being infested with bedbugs, so it is something that we need to take seriously. These bugs can get into our homes, and so it is wise to have knowledge of what is happening with bedbugs especially if you are traveling and staying in hotels," Mr. Douglas says. "The Planet Amazing Bed Bug Shredder is a three part system that kills every last bedbug in your house. Because it's a non-chemical approach, bedbugs cannot become immune to its killing strength like ordinary pesticides. Its ingredients are recognized by the United States EPA as GRAS or "Generally Regarded as Safe and Effective". Its main ingredients are non-toxic to humans and pets so you can apply it yourself without hiring an expensive service." 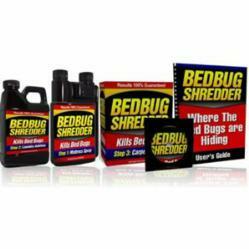 For more information, visit the Bedbug Shredder website. PlanetAmazing.com is the premier manufacturer and distributor of a wide range of organic and inorganic “GRAS” solutions that anyone…no matter their experience…can use to eliminate real everyday problems.